Age 89. Born Oct 6, 1927, in Tacoma WA, the youngest son of Ernest and Luella Little. Died of natural causes on April 24, 2017 in Seattle, WA. Bill grew up near Burton on Vashon Island, WA. 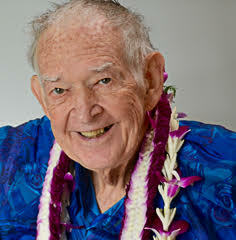 He completed a tour of duty in the U.S. Navy and graduated Phi Beta Kappa from the University of Washington in 1954. After brief employment with Boeing, Bill worked as an Electrical Design Engineer at the UW Applied Physics Laboratory and then for Electro Development Corporation (later Crane), retired 1992. Bill had an inventive mind and liked nothing better than an engaging problem to solve. His interests were many and varied; he loved to tinker and design, remodel and repair. He enjoyed dancing, skiing, hiking, camping, road trips. He liked to make videos and photographs, particularly close-ups of flowers. He and his darling wife of 61 years, Kerry, were famous among family and friends for their imaginative annual Christmas cards, often with moving parts. Bill was known for his agile mind, his depth and breadth of knowledge, his love and kindness toward others. He was a gentle man and will be dearly missed. Bill is survived by his wife, Kerry (Muriel) Little and their children, Bill (Darlene) Green, Peter Green, Greg Little, Nancy (Michael) Stallings, Malcolm Kennedy, and daughter-in-law Jane Piao Little, as well as numerous beloved grandchildren and great-grandchildren. His parents, his brothers Hugh and Joseph Little, and his son Keith Little preceded him in death.